We all know that exercise is good for you. Staying physically active helps keep your heart healthy and your muscles strong, and in cancer patients it has even been shown to ward off relapse. Now a series of independently conducted studies on the effects of exercise in healthy older adults, published on Monday in the Archives of Internal Medicine, confirms that logging time at the gym not only helps maintain good health but may even prevent the onset of chronic diseases, such as heart disease, osteoarthritis and dementia. In one surprising trial, researchers led by Dr. Teresa Liu-Ambrose at the University of British Columbia randomly assigned 155 aging women to three separate groups and directly compared the cognitive effects of two types of exercise: resistance training, done once or twice weekly, in which participants worked out with free weights and weight machines and did squats and lunges, versus toning and balance exercises, which participants did twice a week. By the end of the yearlong study, the women who weight-trained saw an improvement in their performance on cognitive tests of memory and learning as well as in executive functions such as decision-making and conflict resolution  women who trained once a week improved their scores in executive functioning by 12.6%  while those who did balance and toning exercises showed no such improvement. The muscle-strengthening exercise also helped the volunteers, ages 65 to 75, boost their walking speed, a commonly used indicator of overall health status in the elderly, as faster pace has been linked with lower mortality. The Canadian researchers' findings were somewhat unexpected, given that previous studies on the issue have typically focused on aerobic exercise, which experts believe enhances cognitive function by promoting blood flow to the brain. Liu-Ambrose says her team speculated that anaerobic weight training would have a similar effect for other reasons. First, a resistance-training regimen requires a considerable amount of learning, especially for elderly people who may not be accustomed to the equipment. To learn how to use dumbbells, a leg press or a latissimus pull-down machine correctly, for example, the volunteers were required to focus on the task at hand, master new techniques and retain new information about proper and safe use of equipment. Previous studies have shown that such learning can help older adults maintain mental acuity. The women also had to remember their weight settings and adjustments to the seats and keep track of the number of repetitions they completed, says Liu-Ambrose. "There is a lot more learning involved that may not occur if you take up a walking program," she says, noting that it took the volunteers a good two months to get comfortable with the equipment and the training regimen. In addition, Liu-Ambrose says, other studies have found that people who weight-train show an increase in blood levels of a growth factor that is important for maintaining skeletal mass. This factor, it turns out, also promotes nerve growth, which could be another way that resistance training boosts mental function. In a second brain-function study, published in the same journal, scientists in Germany found that increased physical activity was associated with a lower incidence of dementia. In this study, researchers recruited 3,485 elderly residents in Bavaria and asked them about their physical activity. None of the participants had dementia at the start of the analysis, but after two years of follow-up, researchers found that those who exercised at least three times a week were half as likely to have developed dementia, compared with the people who reported no physical activity. Based on his results, says lead author Dr. Thorleif Etgen, a professor of psychiatry and psychotherapy at München University, "it doesn't make a big difference if you have moderate or high physical activity. The important message is that you do any activity. 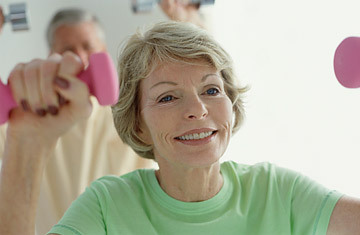 And even if you start late in life, at 60 or 70, there is a benefit, for it's never too late to start exercising." The key words are "moderate or high," according to another study that was published on Monday in the Archives. Dr. Qi Sun, a researcher at Harvard School of Public Health, analyzed 13,000 women participating in the Nurses' Health Study and found that when it came to exercise, more was better. Compared with women who jogged for 20 minutes a week, those who jogged three hours a week or walked briskly for five hours a week were 76% more likely to age successfully, free of chronic illnesses such as cancer and heart disease, as well as mental and physical impairment. Sun's group found that this benefit occurred across all weight divisions, meaning that even among those who were overweight or obese, women who exercised improved their odds of aging without chronic disease. The effects may apply across different age groups as well; the women were at least 60 years old by the time they enrolled in the study, and while Sun was not able to determine how long they had been exercising prior to that, the results suggest that the health benefits are not limited to the young. That was the same message of the final exercise paper in the journal, by researchers at University of Erlangen-Nuremberg in Germany. In this trial, a group of 246 elderly women were randomly assigned to an 18-month exercise regimen or wellness program. The women participating in the four-times-weekly exercise sessions, which involved aerobics and balance and muscle training, improved their bone mineral density by nearly 2%. The women in the wellness group, which focused on walking, muscle relaxation and breathing skills, had a 0.33% increase in bone density over the same time period. Perhaps more important, participants in the exercise group saw no increase in their risk of experiencing a fracture-causing fall, compared with a 66% higher risk in the control group. Despite the positive evidence, however, not all researchers are ready to suggest that exercise is a sure-fire prescription against mental decline or chronic disease in healthy people. To make that claim, a large, longer-term, controlled trial would be needed, in which participants are randomly assigned to exercise or not, and are then followed for the development of chronic conditions such as cancer, heart disease or dementia. Still, says Dr. Marco Pahor, director of the Institute on Aging at the University of Florida and author of a commentary on the studies appearing in the journal, "if you pool all the evidence together, the benefits of exercise seem promising." See more about health care.